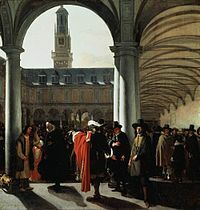 Courtyard of the Amsterdam Stock Exchange (or Beurs van Hendrick de Keyser in Dutch), the world's first formal stock exchange. Modern-day publicly listed multinational corporations (including Forbes Global 2000 companies), in many respect, are all 'descendants' of a business model pioneered by the Dutch East India Company (VOC) in the 17th century. This page was last edited on 29 March 2019, at 22:08 (UTC).